Ra Ra Riot emerged in 2008 after their live show established a sizable buzz. Featuring violinist Rebecca Zeller and cellist Alexandra Lawn, as well as the untouchable tenor of vocalist Wes Miles, the group laid claim to a peppy, fresh baroque-pop aesthetic that soon became the "it sound" of indie rock, thanks in part to their friends in Vampire Weekend. 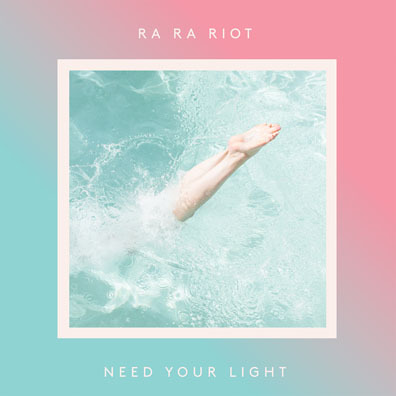 2008's The Rhumb Line and 2010's The Orchard were generally well-received, but after Lawn's departure and a dance-pop misstep (2013's Beta Love), Ra Ra Riot is back with an album of...well, more outdated dance-pop and '80s-indebted ballads. To be fair, Need Your Light is energetic and more polished than Beta Love. It also features fuller instrumentation and the band's best single since The Orchard's "Boy": "Water," co-written and produced by Vampire Weekend's Rostam Batmanglij, is a mid-tempo anthem that manages a nice synergy between the piano-driven beat and the heart-on-sleeve chorus. "So I crawled out of the back door, took off all these tight clothes, jumped into the water," Miles earnestly sings, and one can't help but feel a twinge of freedom and hope. (Batmanglij helps a lot; he has been a factor in Ra Ra Riot's existence for years, even collaborating with Miles on the interesting electronic side project Discovery a few years ago.) Unfortunately, it's all downhill from there; while "Absolutely" is a pleasantly jangly guitar-pop ditty, the relationship musings on "Foreign Lovers" and "Instant Breakup" are somewhat awkward, and "Call Me Out" might as well be an old discarded Journey song. In fact, once you hear it, Miles' voice is a dead ringer for that of that band's Steve Perry, and the backward-facing '80s sound doesn't help that unflattering comparison.